I read a lot, as everyday I realize there’s more I don’t know. Here’s a selection from my reading list, 2014-2015. When a Crocodile Eats the Sun by Peter Godwin (Little and Brown, 2005) – I first read this when I was in Poland, fascinated by how the story of Peter Godwin’s family spanned the two places that have long intrigued me most: Africa and Central Europe. Godwin, an imminent journalist of our age (and possibly my next favorite after Kapuscinski) writes of Zimbabwe during the volatile past decade, focusing on the story of his elderly parents and how his father, a Jewish-Polish refugee of Hitler’s 1939 invasion of Poland, passed him self off as an Englishman for most of his life. It’s heartbreaking in parts, an uplifting example of how to spin family narrative, personal reflection, and current reportage. The Bright Continent: Breaking Rules and Making Change by Dayo Olopade (Mariner, 2015 reprint) – Olopade moves all over the continent is support of her thesis that African nations where the government fails to respond to citizens’ needs initiates a crucible in which innovation takes over. When the government doesn’t work, people find other ways to operate. I appreciated her many anecdotes and examples from East, West, and Southern Africa, but found her to be repetitive and somewhat longwinded. 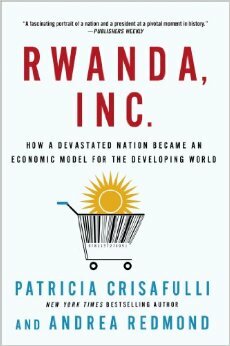 Still, it’s a good read and inspired me to write about Rwandans and cellular phone culture. China’s Second Continent by Howard French (Vintage, 2015 – reprint) – Since I spent a few months in Namibia in 2006, I’ve heard of the Chinese influence across the African continent. Exact statistics are hard to come by, by French estimates that the Chinese presence in Africa is in the eight digits: businessmen, contractors, laborers, immigrants looking for a new life. In this important book, he attempts to understand this neo-colonialism (or is it that?) through scores of interviews with both relocated Chinese and their African neighbors, seeking to understand how China’s power is expanding all over the African continent. Absolutely worth your time. Diamonds, Gold, and War by Martin Meredith (Simon & Schuster, 2007) – Martin Meredith might be the most readable historian I’ve encountered. He’s also a marathon, supremely longwinded storyteller. I imagine his mind as a giant sieve, into which thousands of pages of historical documents, other books, and interviews pour through, with the output of neatly arranged, easy to follow historical narratives. This one is no different, chronicling the hundred years before the founding of the racist Apartheid South Africa. This book is a demonstration of the many factors that influenced the regime, fleshing out characters like Cecil Rhodes and Paul Krueger, making men out of the paper dolls presented in history classes. Fear: The Last Days of Robert Mugabe by Peter Godwin (Picador, 2011) – Godwin revisited the country of his youth, Zimbabwe, in 2008 following the “free” elections held in the country which pitted octogenarian dictator, Robert Mugabe, against political progressive Morgan Tsvangirai. Godwin travels the country, documenting the harassment, abuse, and outright murder committed on behalf of Mugabe’s ruling party as they attempt to cling to power over a country that has been driven into the ground. The “last days” appear as a sort of rueful head shake, as Mugabe grasps at power still, years later. Don’t Let’s Go to the Dogs Tonight by Alexandra Fuller (Random House, 2001) – This book is a classic of memoir, a book that is so steeped in atmosphere that you can almost hear the cicadas buzzing in the cool Rhodesian/Zimbabwean night air. Like Peter Godwin, Fuller grew up in this contested land during its shift from ex-colonial stronghold to Ian Smith’s racist government to Robert Mugabe’s seeming compromise, one which devolved quickly. She too mixes current events with family narrative, always looking straight and level at her parents, never wavering from honesty. Beautiful, resonating, a writer I would aspire to be. A Thousand Hills by Stephen Kinzer (Wiley, 2008) – This book is meant to be a brief history of the nation, with a heavy emphasis on the genocide’s aftermath and the country’s rebirth, but often reads like a pro-Kagame (which is pronounced KA GA MAY, hence, what I have termed “pro-game”) biography of the man, the myth, and the legend. I hardly know what to think of Kagame- there are so many accounts, and just as many perspectives on whether he’s a “visionary leader,” a benevolent dictator, or just another in the tradition of power-hungry African leaders who trample their competition on the way to the top. Kinzer argues that for his faults, he’s lead the country to a place of relative security only twenty years after one of the most horrific massacres history has known. Will he give up the throne when his final term expires in a few years? Time- newly written, each day- will tell. 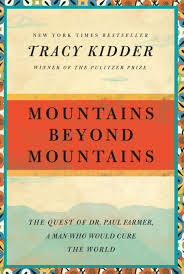 Mountains Beyond Mountains by Tracy Kidder (Random House, 2009) – This book is mostly biographical, focused on Dr. Paul Farmer and the organization he co-founded, Partners in Health. Farmer has been popping up in the media recently as a key player in the West African Ebola outbreak. The book is about his journey, from a quirky childhood to extreme success at Ivy League universities to dedicating his whole life, body, and soul to bringing medical aid to the poor in Haiti, Peru, and beyond. I appreciate the organization’s frank, anti-PC views of poverty: “Some academic types have said to Paul and Jim, ‘Why do you call your patients poor people? They don’t call themselves poor people.’ Jim would reply, ‘Ok, how about soon-dead people?’ ” (p. 100). It’s a heartfelt, stark reminder of the massive gulf that exists in this world between rich and poor – and the importance of doing something. An Imperfect Offering by James Orbinski (Walker Books, 2010) – Orbinski’s book follows the Farmer theme of medical humanitarianism, following the life of the author as he works for Médecines Sans Frontières (Doctors Without Borders) in the 1980s-1990s conflict zones of Somalia, Rwanda, and Afghanistan. His chapters on Rwanda nearly made me ill (and I have an iron stomach for terror and torture in print) as I read it while in Kigali, only meters away from places where the horrors of genocide came to life. Like Farmer, he has no rose-colored optimism about humanitarianism as response to world crises. He understands- and often despairs- in its position as merely a stopgap, making for a readable and very human book about an extraordinary person. 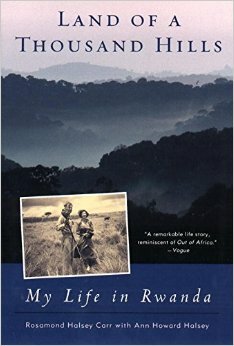 Land of a Thousand Hills by Rosemary Halsey Carr (Viking, 1999) – Carr describes her life in both pre- and post-colonial (or post colonial or postcolonial, depending on which school of literary criticism one adheres to) Congo and Rwanda, providing the perspective of an outsider to the political shifts that occur from the early 1950s until post genocide. Carr is a fascinating mix of new world colonial, dingy white lady, and detail-oriented story teller. Plus, she falls in love with a gay Swedish colonial, wards off rebel attacks, and befriends gorilla whisperer Dian Fossey (of Gorillas in the Mist fame).